Standard light bulbs come in a wide variety of brightnesses and wattages. 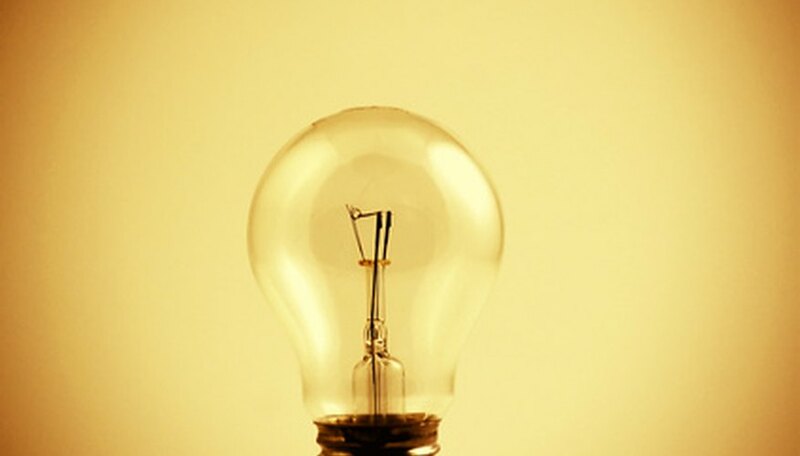 The higher the wattage, the brighter the light the light bulb can produce. In order to measure how many watts of power a light bulb is using, it is necessary to measure a few values during bulb operation. Voltage, resistance and current can be used to find the wattage of a light bulb, but only two of these three variable are actually needed. Set the ammeter to measure current in amps. Connect the negative probe of the ammeter to the negative terminal of the DC (direct current) terminals of the DC power supply. Connect the positive probe to one of the two screw terminals of the light bulb holder. Cut a 1-foot long black wire and strip 1/2 of an inch of insulation off of each end. Connect one end to the second screw terminal of the light bulb holder and connect the other end to the positive terminal of the DC power supply. Turn the power supply on adjust the voltage until the light comes on. Write down the current reading. Turn on the voltage meter and measure the voltage across the two screw terminals of the light bulb holder. Write that number down. Take the current reading and the voltage reading and multiply them together to get the power in watts. For example, if the current reading was 1.5-amps and the voltage was 12-volts, then the power would equal 18-watts.